is MASSAGED into the scalp twice a day. The Extract is a leave-in application. Nisim does not rely on chemical irritants that cause skin irritation for vasodilation. Natural vasodilation occurs when the product is massaged into the scalp. 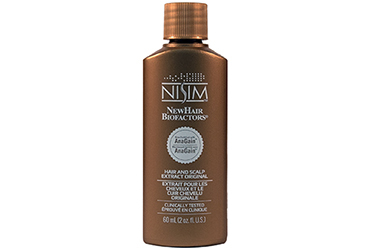 The Extracts must be used in conjunction with Nisim NewHair Biofactors Shampoo, the extracts are not a stand alone product. When you have achieved the desired results (typically 18-24 months) you can discontinue the use of the Extract and maintain your healthy hair using only the Nisim Shampoo. This is not a product you have to use for the rest of your life. I think this product actually works and my hair is growing thicker on the top of my head. Thrilled with six months use of the product. A good and effective product. The only thing that needs further improved is the nozzle of the bottle. It is almost impossible to control the extract flowing out of the bottle. I hope it could come with a nozzle that I could control the flow "drop by drop" when I slightly squeeze the bottle. I just love your hair products......I am not seeing all those hairs in the sink anymore. I have been using all the products for 2 months. I love Nisim!! Customer service rep was able to help me make the correct purchase for my needs. I referred my mother-in-law to Nisim because she has the same hair loss problem.